Open plan offices are increasingly popular, and can be found in a diverse array of workplaces: from premium headphone manufacturers, to even international spy agencies. But they’re also, let’s face it, pretty awful. Proponents of the open-plan office design fête the fact that it permits greater collaboration — if you can see your co-workers, it’s easier to strike up a conversation with them and share new ideas. That’s good for company culture. However, the downsides more than outweigh that, as open plan offices are hugely distracting. Your productivity suffers if your concentration breaks whenever someone sneezes, or strikes up an unwelcome conversation with you. Countless companies have tried to address this problem with technology. Plantronics, for example, spent millions of euros on building a headquarters that used soundscaping to filter out distractions. 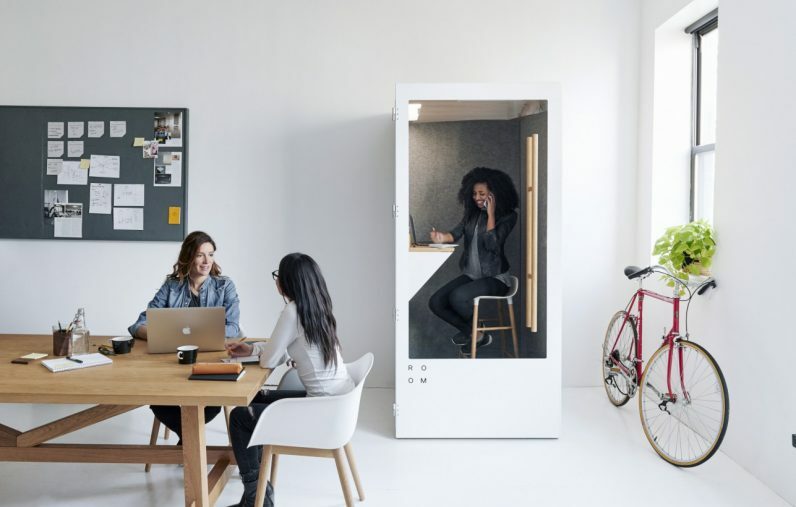 And today, a New York-based company called ROOM (their caps, not mine) announced its new soundproof “privacy pods,” which can be installed within an office to create pockets of isolation. ROOM’s privacy pods are a little bigger than a phone booth, and come shipped flat packed. According to the manufacturers, they take just thirty minutes to assemble. Once built, they can easily be moved to another part of the office. From the pictures included with the press release, the ROOM pods have a small ledge big enough for a laptop, and are large enough to include a chair. It’s not implausible to imagine using this for day-to-day work, although it’ll undoubtedly be a little claustrophobic, especially if you’re used the the airy spaciousness of a conventional office. The front of the booth is constructed primarily out of glass, allowing anyone to see if it’s occupied without blindly barging in. Overall, ROOM says its privacy pod is built with 60 percent recycled plastic bottles. It’s also soundproof. Not only will your concentration remain unbroken by the cacophony of coughing and ringing phones, any conversations you have within the booth will remain private. It mercifully also comes with a built-in fan and ventilation system, which is probably for the best, especially during those in hot summer months. Some smells cannot be unsmelled. ROOM already has a long list of pre-orders for its privacy pods. At $2,995, they’re not cheap. I also can’t help but feel they’re a sticking plaster over a bigger problem. Open plan offices just aren’t that great. A 2014 study from Ipsos laid bare the distracting nature of this popular office design, showing that on average, workers lost 86 minutes a day due to distractions. Overall, 85 percent of people dislike their working conditions, and struggle to concentrate. They’re also really bad for our health too. A separate 2014 study from insurance company Canada Life found who work in open plan offices take 70 percent more sick days than those who don’t. And in 2013, the University of Arizona found that when someone comes into work sick, they’ll contaminate half of the commonly-touched surfaces — like telephones, doorknobs, and even the office fridge. Blegh. Advances like ROOM are undeniably cool, but rather than acquire expensive gadgets, perhaps it’s worth workplaces addressing the root cause of the problem? Take it from me, an openness to remote working is a great first step.